When choosing a classroom pet, you have three main considerations -- the welfare of the animal, the safety of the children and practical aspects. Between them, these pretty much rule out most mammals, including rabbits and guinea pigs, who need far too much space and care, and birds. Reptiles and amphibians are not at all suitable because, aside from their care needs, they often carry salmonella. Aquarium fish are sensitive to temperature fluctuation, and their tanks are tricky to move during vacations. The best, and easiest, choices tend to be invertebrates and perhaps certain smaller rodents. The advantage of rodents is that children relate well to them. The primary disadvantage is that they are a substantial commitment in terms of care, and you can’t leave the cage at school over weekends. A lesser disadvantage is that they can be extremely noisy, which is distracting. 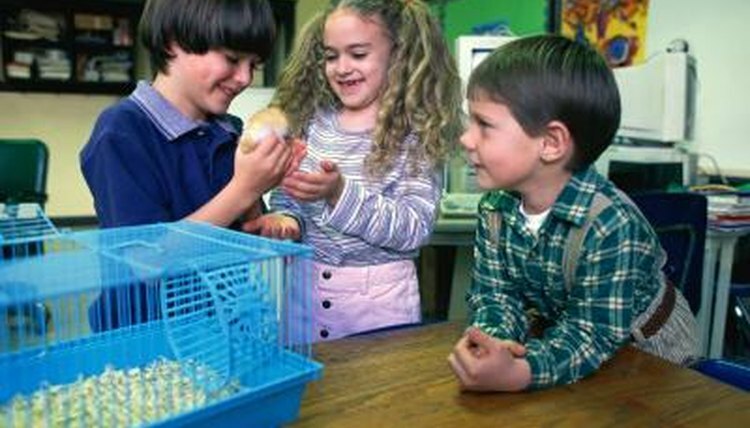 Provided that you as the teacher are prepared to take on the responsibility of caring for the animals -- meaning the cage is coming home with you for weekends and vacations -- and the children are old enough not to harm them through careless handling, small rodents would certainly be a popular choice. Remember to check that no child in the class has a pet allergy before going this route. Opt for hamsters, gerbils or mice, which are small enough to live happily in a portable cage. Note, though, that hamsters are nocturnal, so you might not see much of them. Rats score high on friendliness, but they're a bit too large. More exotic animals, such as chinchillas or degus, require far too much care and are not suited to a classroom environment. Stick insects or grasshoppers are the closest thing to a low-maintenance pet around, needing a simple tank and the minimum of care. You can safely leave the tank in the classroom at night and on weekends, although somebody needs to take the insects home during vacations. Because these insects are fairly easy to care for, that somebody could be a responsible child, provided her parents agree. Insects might not be as immediately appealing as mammals, but they are active and interesting to watch. They are also suitable if you or a child has allergies. An alternative to a strictly classroom pet is to employ your own as a classroom assistant, which opens the door to much larger animals. While it might be tempting to let children take in theirs on a rotating schedule, this is not at all a good idea, since you don’t know how these animals will behave with strange people. Your own, however, could be a great addition to the class. If you have a thoroughly well-socialized dog, for example, bringing him in occasionally might provide all the benefits of a classroom pet without the disadvantages. Are Hedgehogs Easy to Take Care Of?